MARITIM B , EL JUVENIL . U.D. TAVERNES - UNION BENETUSER-FABARA C.F. DISCOBOLO-LA TORRE A.C. - C.F.F. MARITIM "B"
C.D. CAMPORROBLES - DISCOBOLO-LA TORRE A.C.
C.F.F. MARITIM "B" - LEVANTE U.D. "D"
U.D. TAVERNES - C.F.F. MARITIM "B"
DISCOBOLO-LA TORRE A.C. - LEVANTE U.D. "D"
C.F. MALVARROSA - DISCOBOLO-LA TORRE A.C.
C.D. CAMPORROBLES - UNION BENETUSER-FABARA C.F. C.F.B. GANDIA - LEVANTE U.D. "D"
CIUTAT D´ALZIRA FUTBOL BASE - DISCOBOLO-LA TORRE A.C.
CIUTAT D´ALZIRA FUTBOL BASE - UNION BENETUSER-FABARA C.F. C.D. CAMPORROBLES - C.F.F. MARITIM "B"
UNION BENETUSER-FABARA C.F. - DISCOBOLO-LA TORRE A.C.
CIUTAT D´ALZIRA FUTBOL BASE - C.F.F. MARITIM "B"
C.F. MALVARROSA - LEVANTE U.D. "D"
C.F.F. MARITIM "B" - UNION BENETUSER-FABARA C.F. VALENCIA FEMINAS C.F. "C - C.F.F. MARITIM "B"
UNION BENETUSER-FABARA C.F. - LEVANTE U.D. "D"
VALENCIA FEMINAS C.F. "C - LEVANTE U.D. "D"
C.F.F. MARITIM "B" - DISCOBOLO-LA TORRE A.C.
C.F.B. GANDIA - UNION BENETUSER-FABARA C.F. LEVANTE U.D. "D" - C.F.F. MARITIM "B"
LEVANTE U.D. "D" - DISCOBOLO-LA TORRE A.C.
C.F.B. GANDIA - C.F.F. MARITIM "B"
U.D. TAVERNES - LEVANTE U.D. "D"
U.D. TAVERNES - DISCOBOLO-LA TORRE A.C.
C.F. MALVARROSA - UNION BENETUSER-FABARA C.F. C.F.B. GANDIA - DISCOBOLO-LA TORRE A.C.
DISCOBOLO-LA TORRE A.C. - UNION BENETUSER-FABARA C.F. C.F. MALVARROSA - C.F.F. MARITIM "B"
C.D. CAMPORROBLES - LEVANTE U.D. "D"
VALENCIA FEMINAS C.F. "C - UNION BENETUSER-FABARA C.F. VALENCIA FEMINAS C.F. "C - DISCOBOLO-LA TORRE A.C.
UNION BENETUSER-FABARA C.F. - C.F.F. 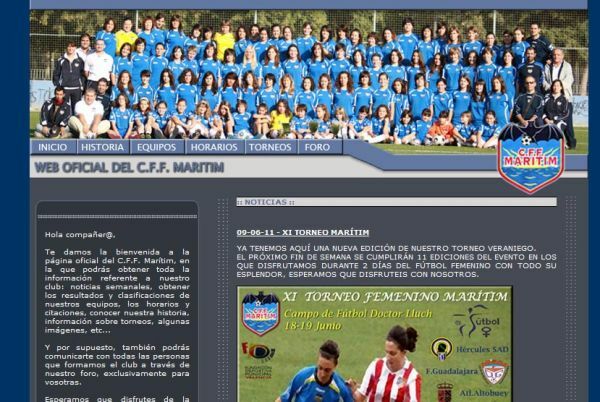 MARITIM "B"
CIUTAT D´ALZIRA FUTBOL BASE - LEVANTE U.D. "D"
LEVANTE U.D. "D" - UNION BENETUSER-FABARA C.F.